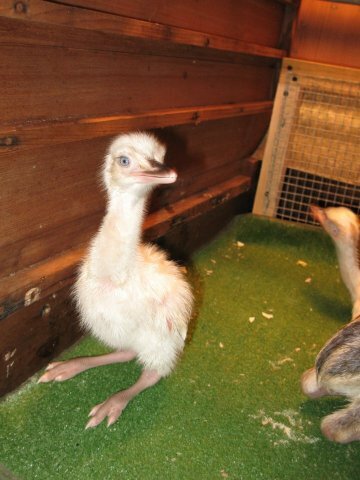 We raise both white and grey rhea chicks. Please contact us for pricing and to place an order. 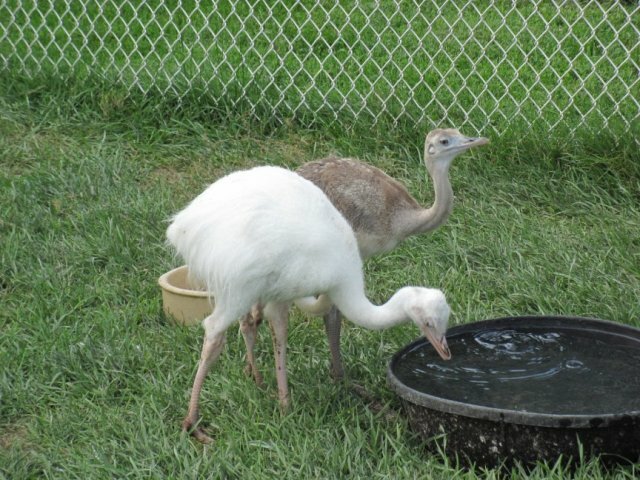 Rhea chicks are normally available starting in July each year. 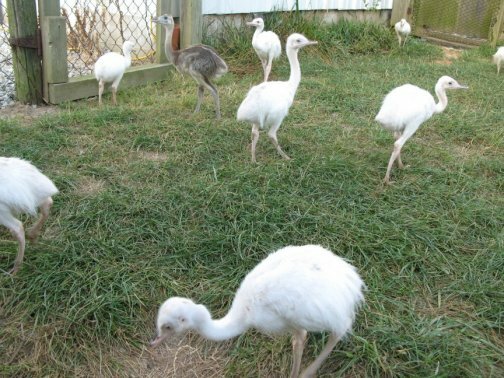 Rhea chicks are shipped via Express Mail through the post office. Hopkins' Alternative Livestock does not accept any responsibility for the use of this information by others than Hopkins' Alternative Livestock. 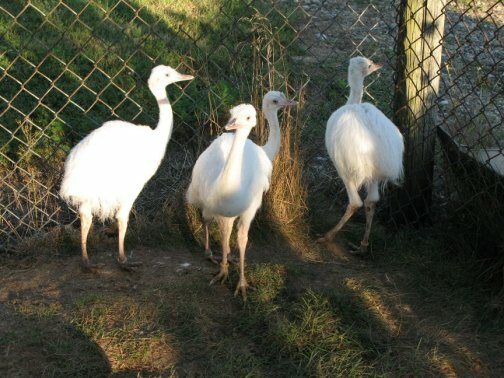 Rhea eggs are incubated in redwood incubators at a humidity level of 50% and a temperature of 99.5 degrees F. Eggs are turned by hand three times a day. 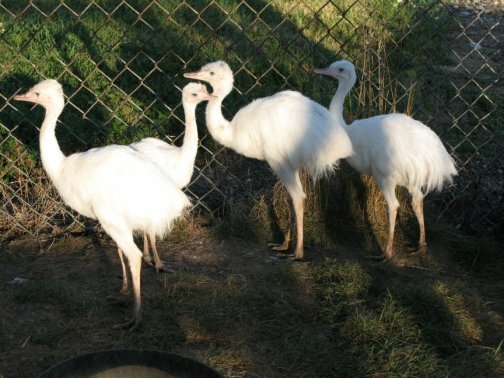 Incubation takes 34-35 days. 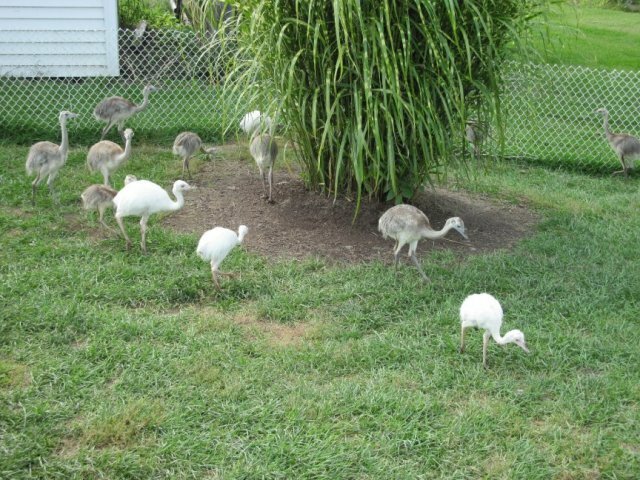 The following six photos show how to hatch a rhea egg. The first step is to be patient! This process will take at least a day to complete. The egg is candled in order to find location where the chick has pipped the inner membrane. By allowing the chick to pierce the inner membrane this will minimize any bleeding of the membrane. 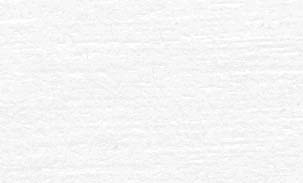 The spot is then marked with a X. Then, at the X, the shell is broken away to the extent of the air space remaining in the shell. 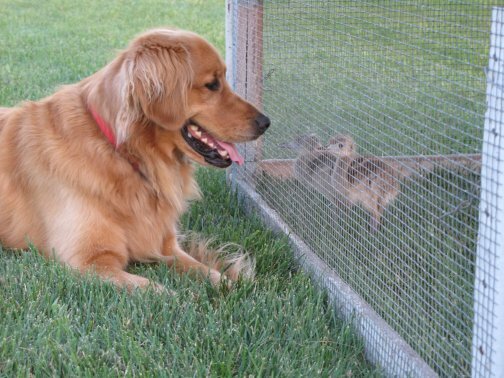 Do not tear away the membrane any more than the chick already has. 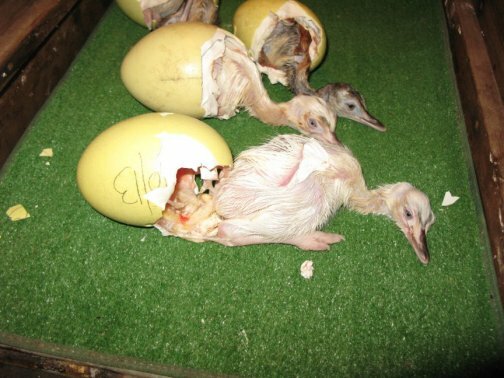 If too much of the membrane is torn while it is still wet, excessive bleeding will occur which weakens the chick and can be fatal to the chick. Once the shell is broken away, the egg is placed back in the hatcher for approximately 12 hours. Remove the egg and spray the membrane with a fine mist of water. Gently peel the membrane back to the line of the already broken shell. Gently grasp the chick's beak and pull the head and neck out of the shell. Place the egg back in the hatcher and allow the chick to complete hatching on its own. Allowing the chick to struggle to hatch will ensure that the remaining yolk sack is completely pulled inside the chick's belly. 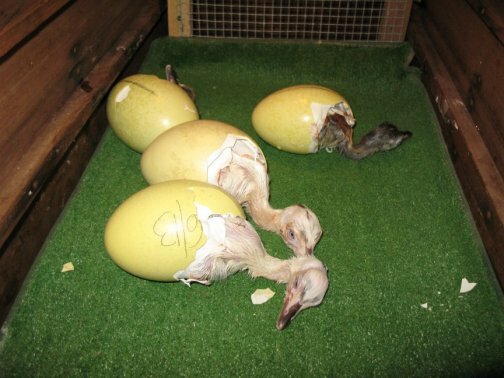 Rhea chicks are hatched in redwood incubators used as hatchers. 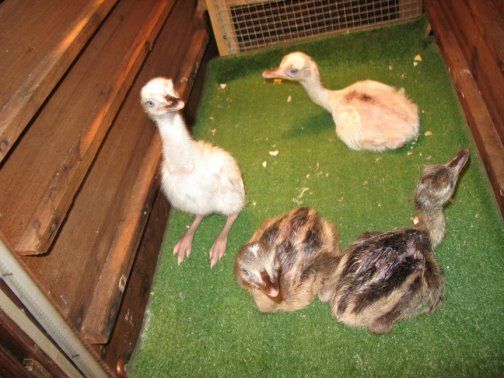 Eggs are moved from the incubator to the hatcher at 35 days and are no longer turned. 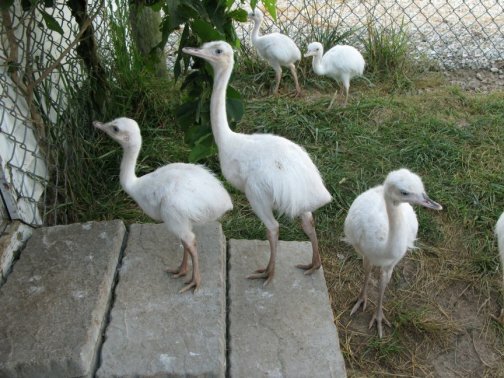 Eggs normally hatch at 36-38 days. Chicks are placed in a homemade brooder after one day in the hatcher. A heat lamp is used for warmth and astroturf mats are used to provide good footing. 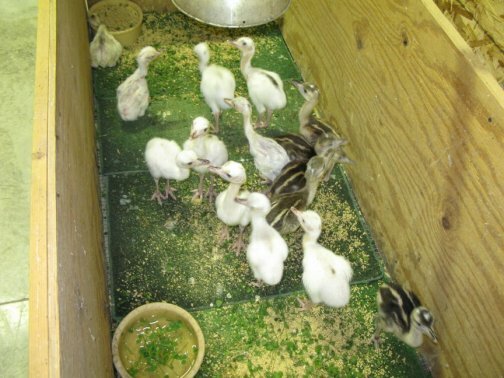 Chicks are started on a medicated started feed and chopped lettuce or clover leaves. We have found that adding an incandescent light to brighten the inside of the brooder building will draw the chicks inside at dusk or when the weather is overcast and rainy. The chicks will come inside to warm up and associate the incandescent light with warmth. The radio is an extremely valuable tool used to calm the chicks. The radio playing sensitizes the chicks to noise and overall, results in much calmer chicks as well as adults. As soon as weather permits, the chicks are moved to an outside brooder pen during the day. Chicks are kept in heated brooder at night. 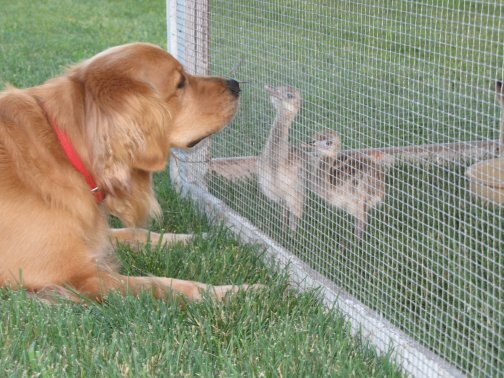 The most important thing for rhea chicks is to have a golden retriever guard dog. 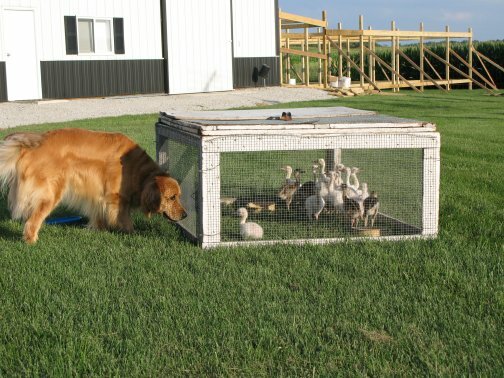 Forget those Great Pyrenees!! Golden Retrievers Rule!! 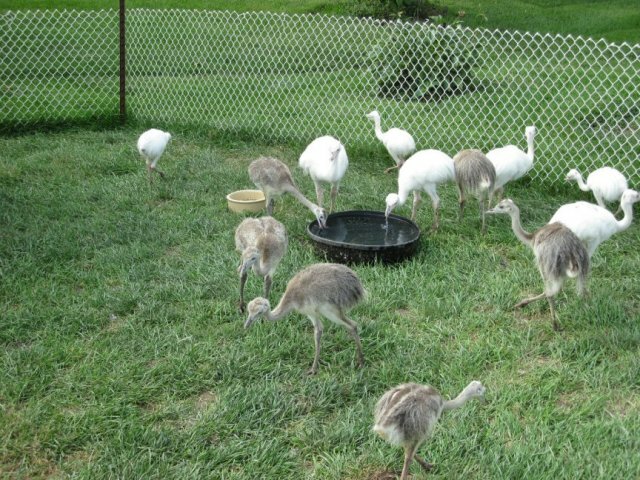 In our experience, the keys to healthy rhea chicks are plenty of exercise, limited feed, and plenty of sunshine!